This is the second part of a multi-part series about the impact of hydroelectric dams. Part one can be found here. Imagine this idyllic scene: a sprawling lake nestles amid rolling forest-topped hills, projecting beauty and tranquillity. But sometimes the smothered reality rises to the surface. Disquieting the view, the top of a tree may protrude where pleasure boats are gliding. In a drought, a church steeple holds a finger above the water to register its objection. For a moment at least, we are forced to remember what we have been burying beneath our supposed improvements. Across the world, where large dams have been built, we can count the cost not only in what happens downriver of the obstruction (see “Voyage of the Dammed”). We can also follow the consequences behind the dam and see how the disruption that is nurtured there spells yet further devastation beyond it. Every way in which dams damage rivers and their valleys is deadly for humankind because we rely on rivers, more than we realize, to sustain our own lives. It is a harmfully false dichotomy to imagine that what denudes and poisons watersheds, aquifers, riverbanks, riverbeds, estuaries, floodplains, and deltas harms “nature” but not us. We rely for our own continued life on what we are eradicating. However, there are certain kinds of consequences which immediately and sharply make this fact plain. Giant hydroelectric dams demonstrate their perverting and destructive essence as they visit cataclysmic disasters on people, first by drowning and displacing historic communities, and then by exacerbating flooding. With each great dam comes a deluge. Behind the towering edifice that awes disciples of gigantic infrastructure lies the proportionately vast reservoir it has necessitated. Every piece of river engineering can only redirect, not eliminate, the water. And, even if we were to believe all the hype of a dam’s benefits, the land flooded by the restrained river is a heavy price rarely considered. “Construction of the Tucurui hydropower station in the rain forest of the Amazon River basin,” Paul Josephson relates in Industrialized Nature, “inundated nearly 3,000 square kilometres (more than 740,000 acres) of land, [and] destroyed fragile ecosystems.” The rightly infamous Three Gorges Dam on China’s Yangtze River has, in the end, required a 410-mile-long reservoir. The dams on Russia’s Volga River—one of the most engineered rivers in the world—have cumulatively buried over 7,500 square miles of land. The Chinese government had long denied baleful predictions during the decades of work constructing the dam, but in 2007, “Chinese officials staged a sudden about-face,” Hvistendahl continues, “acknowledging for the first time that the massive hydroelectric dam…may be triggering landslides, altering entire ecosystems and causing other serious environmental problems—and, by extension, endangering the millions who live in its shadow.” Yet it should not have taken the beginning of landslides to convince anyone of their likelihood. 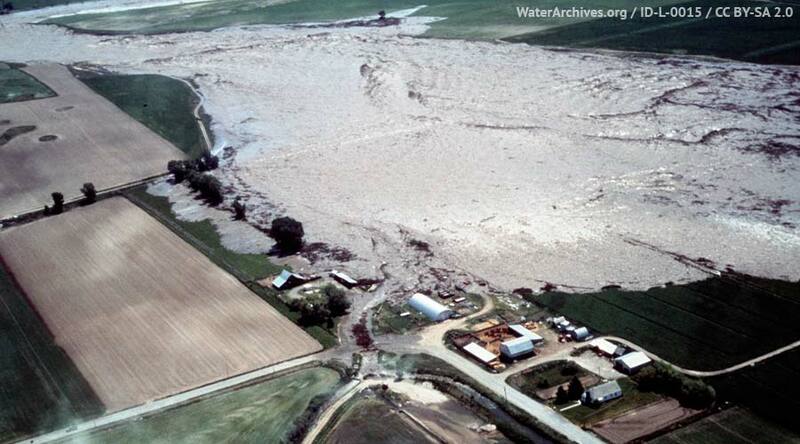 The deleterious effects of dam reservoirs have been observed for decades. In 1963, the worst landslide to date occurred behind the huge Vajont Dam in the Italian Dolomites. When the reservoir had been initially created and filled three years before, instability had been noted on Monte Toc, which towered above the new lake. Then one October evening, after a period of heavy rain, over nine billion cubic feet of rock broke from the mountain, crashing all at once into the reservoir, and producing a massive wave which surged 460 feet over the dam, drowning the town of Longarone below it and killing nearly two thousand of its residents. Part of the deadly geological disturbance caused by the Vajont dam reservoir was an increase in seismic activity, and the evidence over many years of a correlation between large dam reservoirs and seismic activity is hard to deny. Indian seismologists Harsh Gupta and BK Rastogi meticulously compiled and analyzed this evidence in their 1976 book Dams and Earthquakes. Regarding the Vajont case, they noted that between the opening of the reservoir and the catastrophe, 250 tremors were recorded. “The three significant uprises in the Vajont reservoir [were] followed by three bursts of seismic activity…. Following every peak, the decrease in water level [was] followed by decreased seismic activity.” Furthermore, they added, “the maximum activity [in] September 1963 was followed by the disastrous landslide of October 9.” Similarly, at the Monteynard Dam on France’s Drac River, tremors were recorded a few days after the reservoir was first filled on April 15, 1963, culminating in 4.9 magnitude earthquake ten days later. As with Vajont, seismic activity rose and fell along with the depth of the reservoir. The correlation between the filling of dam reservoirs and seismic activity is both present and urgent because large dams are frequently built upon fault lines, including the Three Gorges Dam. As Sichuan-based geologist, Fan Xiao explains in Hvistendahl’s article, “When you alter the fault line’s mechanical state,” with the addition of millions of tons of water which seeps into the rock, “it can cause fault activity to intensify and induce earthquakes.” In an article for the journal Scientific Reports, geologists Marco Scuderi and Cristiano Collettini further elucidate. “Fluid overpressure is one of the primary mechanisms for tectonic fault slip, because fluids lubricate the fault and fluid pressure reduces the effective normal stress that holds the fault in place.” In other words, there is an inverse relationship between fluid pressure and stabilizing geological friction—as the former rises, the latter dangerously decreases. In this way, even dormant fault lines have been reactivated, including the one beneath the Hoover Dam’s Lake Mead. Beneath numerous dam reservoirs lie the remains of extinguished human societies. The 2000 World Commission on Dams report estimated that, in the previous fifty years, 40 to 80 million people had been displaced by dams. Millions more have suffered a similar fate since. There is ultimately no adequate restitution for the destruction of one’s homeland, but many have received no recompense at all. In 2007, China’s Prime Minister Wen Jiabao admitted that at least 23 million people had lost their homes to dams in that nation alone. The people sacrificed to dams are ignored in official presentations of dam construction, as if they never lived in the places from which they have been removed; once condemned to a transient life in temporary settlements, they are often outside the reach of statistics or government assistance. “The millions of displaced people don’t exist anymore,” wrote Booker Prize-winning author, Arundhati Roy, regarding the many displaced by India’s hydroelectric dams. Even as former property owners are inadequately assisted, many of the uprooted are legally landless and are left to fend for themselves without the farms, folkways, and communities on which they relied. “Once they start rolling, there’s no resting place. The great majority is eventually absorbed into slums on the periphery of our great cities, where it coalesces into an immense pool of cheap construction labour (that builds more projects that displace more people).” For example, thousands of Indians living on fertile agricultural lands in Jabalpur were evicted in the 1980s so that their villages and fields could be covered by the reservoir of the new Bargi dam. When the reservoir was first filled, it even inundated areas where some had been resettled. “People were flushed out like rats from the land they had lived on for centuries,” Roy describes. “They salvaged what they could, and watched their houses being washed away.” Incredibly, some of those displaced are due to be forcibly removed again to make way for new nuclear power plants, which will also voraciously feed on the burdened waters of the Narmada River. Meanwhile, the whole sordid process starts over again upriver, with the massive newly inaugurated Sardar Sarovar Dam and the 200,000 forced from their homes for its benefit. According to International Rivers, the Three Gorges Dam forced out 1.2 million people, as 13 cities, 140 towns, and 1,350 villages were engulfed by the waters of the dam’s reservoir. Hundreds of thousands more have to move due to the instability of the land around the dam. The toll goes on and on, as Pearce notes: “The Akosombo on the Volta in Ghana expelled 80,000 people, the Aswan High Dam in Egypt 120,000…the Kariba in southern Africa almost 60,000, the Tarbela in Pakistan more than 90,000.” Bountiful naturally irrigated farmland is often snatched away in exchange for less and worse territory and the promise of irrigation from the dam that either never arrives or brings salinization and water-logging. But while China, India, and Brazil have become centers of large-dam-building fever as it has spread across the planet, it was the United States and Soviet Union who pioneered the hubristic dreams and destructive reality at its core. Once Stalin’s Soviet regime began choking the Volga with hydroelectric dams, over 500,000 Russians had to make way for the reservoirs, including the 130,000 who lived in and around the towns of Mologa and Kalyazin, buried under the Uglich reservoir in 1941. Today, bearing witness to the people who not only lost their homes, but were unable to speak of it for half a century, the belfry of Kalyazin’s former St. Nicholas monastery stands incongruously amid the man-made lake, like a tree growing from a smokestack. At the same time, in the United States, dam-building focused on the West, invariably displacing native tribes. In the 1950s and 1960s, “Indian lands became sacrifice areas in massive flood-control and hydroelectric projects,” asserts Laurence Hauptman, one of the foremost experts on American Indian tribal history and dispossession. The US Army Corps of Engineers and the Department of the Interior’s Bureau of Reclamation worked at a fearsome pace and great expense to re-engineer the vast region, picking winners and losers as they went. The “Big Bend, Bonneville, Boyson, Cochiti, Dalles, Fort Peck, Fort Randall, Garrison, Glen Canyon, Grand Coulee, Oahe, Roosevelt, and Yellowtail Dams,” Hauptman explains, were all “devastating to Native peoples.” For example, the Garrison dam flooded 150,000 acres of the Three Affiliated Tribes’ (Arikara, Hidatsa, and Mandan) reservation in North Dakota, and “permanently shattered the lives” of this community, while the Big Bend, Fort Randall, and Oahe dams inundated 200,000 acres of Sioux territory in the Dakotas. One of the starkest examples, however, occurred in the northeast. 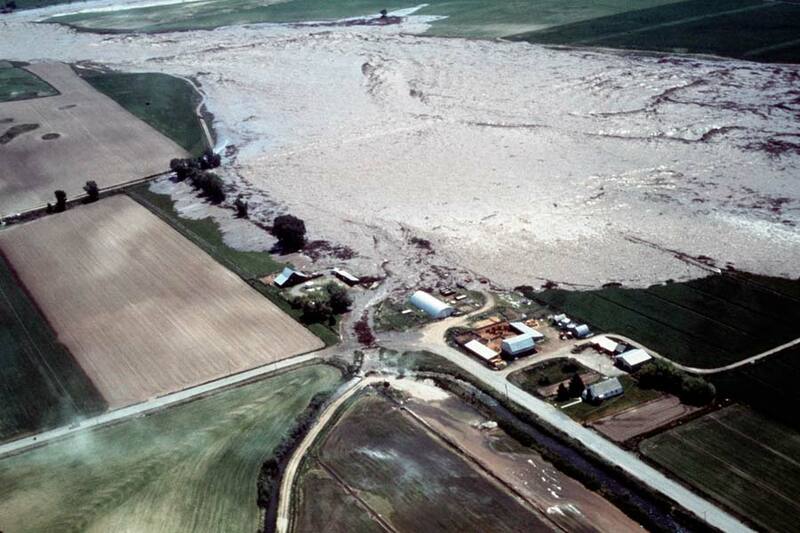 The Snake River Valley floods after the collapse of the Teton Dam near Rexburg, Idaho in June, 1976. Courtesy of WaterArchives.org, CC BY-SA 2.0. Even if we open our eyes to the travesties visited upon peoples and places by dam reservoirs, can we at least rest assured that a positive service is, overall, being rendered? Most hydroelectric dams are built with the promise of flood control. But even as dams keep the rivers below from the regular flooding that sustained the life of its floodplain, they also worsen the severity, frequency, and destruction of irregular floods. Large dams make rivers narrower, deeper, and straighter than they would naturally be and denude them of life (see “Voyage of the Dammed”). Exacerbating this consequence is that all of the other various forms of river engineering—particularly dredging, channelization, and levees—produce the same effect. That the flood-control of dams and other river engineering has heightened floods is not mere conjecture. For example, in 2018, geoscientist Samuel Muñoz and his colleagues released a study on the Mississippi, concluding that “the artificial channelization (confinement to a straightened channel) has greatly amplified flood magnitudes over the past century.” As Emma Marris summarizes the research in Nature, “Now when the river overtops its banks, the flood is faster, bigger and more powerful than it would be without human intervention, the researchers found. In essence, the same engineering works that prevent small floods make big floods worse.” The findings about causation are important because we have come to lazily attribute all disastrous changes to climatic warming. While this has had some impact on the flooding Muñoz analyzed, Rogers reports in Wired that “75 percent of that [increased] risk comes from human engineering of the Mississippi for navigation and flood control.” Likewise, Criss, who published research in 2015 indicating that the Corps of Engineers was now significantly underestimating the extent of future flooding in the American Midwest, insists that climate change “is not our hugest problem,” in relation to such greater floods, “and that does not explain this. This river constriction is the No. 1 cause.” Across the world, where many billions of dollars have been spent on flood control, flooding is ever more severe. Despite all this downriver disruption, surely the dam itself, towering and impressive, is a model of control and stability? Instead, it is in the very nature of a hydroelectric dam to store up its own negation and expose its surroundings to even more cataclysmic risk than we have already considered. The height of a dam is partly based on projections of how high a once-in-a-century flood would be. But this reasoning is counteracted by the other main purpose of dams—efficient power generation—which requires a dam reservoir to be as full as possible. This means that dam operators will often not lower the level of reservoirs until it seems unavoidable. Consequently, by the time dams eventually release water from the reservoir, they do so in ways that create sudden serious floods. Thakkar describes what happened at the Ukai dam in India’s Gujarat region, when the dam filled up near the conclusion of monsoon season. “By the evening of August 8 , the dam was releasing over twice the amount of water that the river downstream could carry.” As the New York Times reported, “With water brimming well past the permitted levels at the 350-foot Ukai Dam…the engineers apparently threw open the reservoir’s 21 sluice gates. Water then did what water does. It surged downriver, swallowing this city of three million people like a hungry beast.” Mercifully, there were “only” 120 deaths, but the damage was extraordinary. As dams prove increasingly more fragile than expected, the long-term costs mount further. In 2017, the Oroville Dam in California came close to failure, sending 180,000 from their homes, and leading to $1.1 billion of restoration on the faulty spillways. Hydroelectric dams also routinely and significantly under-perform estimates in the actual production of electricity. As sharply diminishing power production from dams in India has illustrated, performance is likely to decrease over time, thanks to siltation. Hydroelectric dams simply do not bring the productivity and economic regeneration that supposedly induced the World Bank to invest $75 billion in hydroelectric dam-building during the peak of its popularity. Incredibly, however, gigantic new dams are still being planned and built worldwide. Despite a brief hiatus following the criticisms of the World Commission on Dams report, the World Bank is back in the game, while China has become the world’s primary source of loans to governments for great dams—in 2017 alone, Chinese banks provided $9.2 billion in such capital. While long-term problems build up, the short-term cycle of vain promises and effusive spending continues. The modern economics of destruction—cutting across political systems, continents, and creeds—remains as trendy and hard to halt as it was when the Cold War’s opponents strove to match each other in the volume of concrete clogging up their waterways. As ever, vast monuments to artificial might cannot propel us away from the need to live within the realities of creation.